Shah Rukh Khan's son AbRam has been very vocal and expressive about how he doesn't like being clicked. Every time the star kid steps out, the paparazzi is literally waiting to hound him and click his photos. Something similar happened earlier today as Shah Rukh and AbRam were snapped at the airport. As they were seen arriving at the Mumbai airport from London, the shutterbugs couldn't stop clicking them. It is slightly disturbing to see AbRam hide his face with toys and clothes as the cameramen take his photos. The videos and photos are all over the internet where AbRam is trying his best to avoid the media glare. It is actually not cool for the paps to go on clicking star kids every now and then as it creates the wrong impact on the,m. In AbRam's case it is quite clear that he is in no mood to be photographed so the cameramen should just leave it at that! 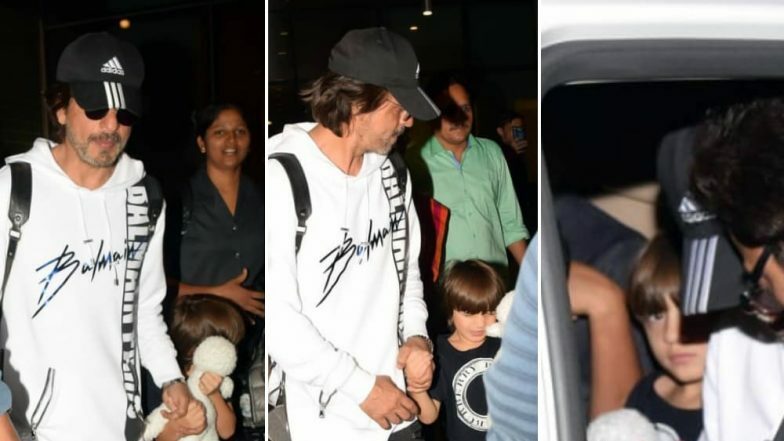 Shah Rukh Khan Finally Reveals the Reason Behind His Short Trips With AbRam and It’s Damn Adorable. This isn't the first time AbRam has refrained from posing for the cameras. A video from Aradhya Bachchan's birthday party went viral a couple of months back where he was clearly seen shouting at the media saying, "No photos!" and the cameramen continued to click him, despite him say a straight no to them. We know for a fact that SRK and AbRam keep going on trips all around the world every once in a while. If these pics are about the same too, we'd love to know where in London they holidayed at this time! Shah Rukh Khan’s Little Munchkin AbRam Khan Thinks Amitabh Bachchan is his Grandfather - View Pic. In his recent conversation with Mumbai Mirror, when the Raees star was asked about his habit of planning trips with AbRam, he said, "My other two kids were not so social but AbRam enjoys spending time with my friends and me. Once Gauri dropped him off at Mehboob Studio for an hour. Now he's happy to come here, watch movies, play football, play with cats and hens... He doesn't need you to be with him."